This is another perspective on The Fool’s Journey. We can separate the whole journey into 2 big parts before and after The Wheel of Fortune card. It marks the frontier between the mundane world and the spiritual part of the journey. The first half is about society, family, success in the real world, while the second part is about exploration of more mystical, spiritual, transcendental ideas. I see the Wheel of Fortune as the Wheel of Samsara. The cyclic nature of our experience. And to move forward on this journey you need to accept that there are things beyond repetitive cycles of your everyday life. The Wheel of Fortune is like the World card. But the World signifies a total completion, synthesis of both spiritual and material. While the Wheel of Fortune marks the point where you understand how the world works. It’s similar to how people use meditation, psychedelics and other spiritual practices to be successful and more productive, while missing out on the real purpose of those religious practices. Being more self-aware of course can make you more successful, but this is the opposite of its true goal. 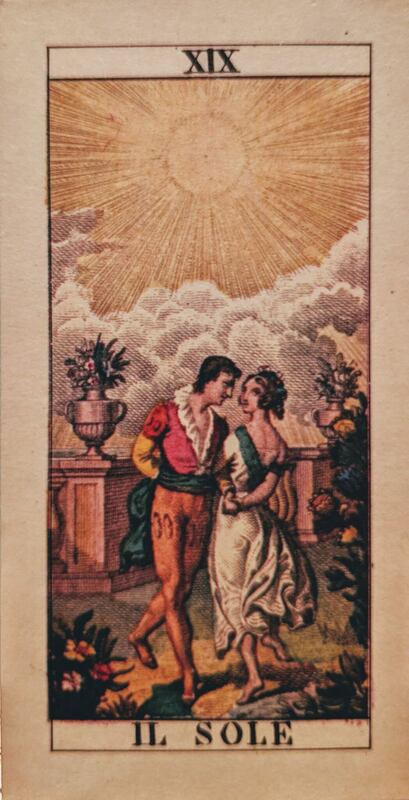 And I found an interesting thing about the cards before and after the Wheel of Fortune. If we take all the cards from 1 to 9 they seem to me very connected to cards 19 to 11 in the reversed order. 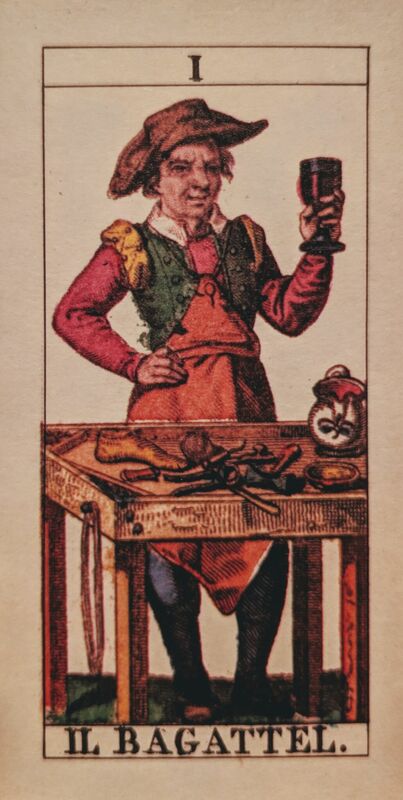 The Fool card is separate. The Final Judgement card and The World are also very special and separate from the cycle. 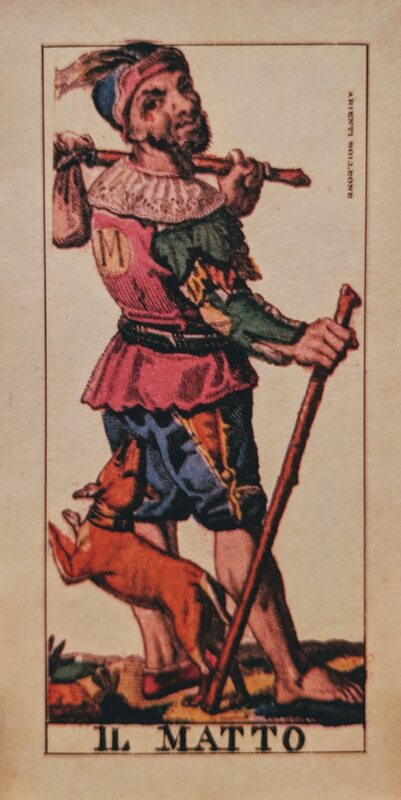 The Fool is the beginning and the end of the tarot deck. The Final Judgement is the exit point outside, to a new level. The World is about reaching this new level of understanding where you can start anew as the Fool again. The Judgement card is like a reverse switch.  It replays and brings back all your experience to make a step on a new level. That’s also another reason why I take arcanas 19 to 11 in the reversed order. Both cards have a masculine energy of creation. The Magician is a trickster. He creates the Journey and this game of tarot. By a trick, a magical spell, he is like a mystic father figure to our protagonist. The Sun is like the first day on Earth. Success of this creation, it illuminates the outside world. Both cards have a feminine energy of mystic wisdom. The High Priestess is also knows and La Papessa, she’s also like a trickster character like a part of a couple with the Magician. She holds a book of knowledge in her hands and she’s a guide to this knowledge before our protagonist is even born into this world. The Moon shines the light into the unconscious mind. It opens up what was hidden inside of the protagonist from the very beginning of the journey, before he was even born. The High Priestess is the source of this knowledge, and the Moon finally opens it up to the Fool. Both cards have a feminine energy of love. Another couple of parents ahead. This time these are the real parents of the Fool that bring him into this world. The Empress is a mother, she is the source of love. This is how you learn what unconditional love is — from the way your mother cares about you. The Star is finding this source of love inside of yourself. When you understand that love is infinite when you focus on giving it back into the world, and not on receiving. Both cards have a masculine energy of creation and ambition. The Emperor is a father, he is the source of power and control. You learn what it means to be assertive, masculine, he is the ruler of your world. The Tower is the destruction of your ambition. There should be some toxic masculinity joke here. But in the end the Tower teaches you where this ambition can lead to. That the biggest success in this world will amount to nothing. The Emperor may seem like a God when you are a child, but he is not. Both cards are about egoism and community. 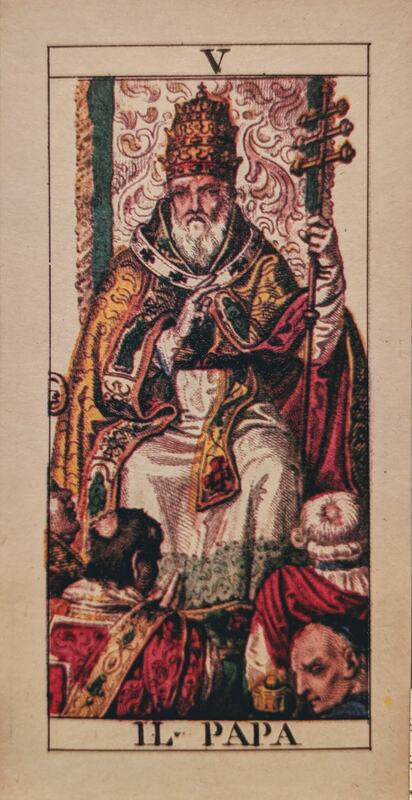 The Hierophant is a teacher a leader of a community. You learn to follow someone’s lead, to be united together with other people by the same leader. You are a follower. 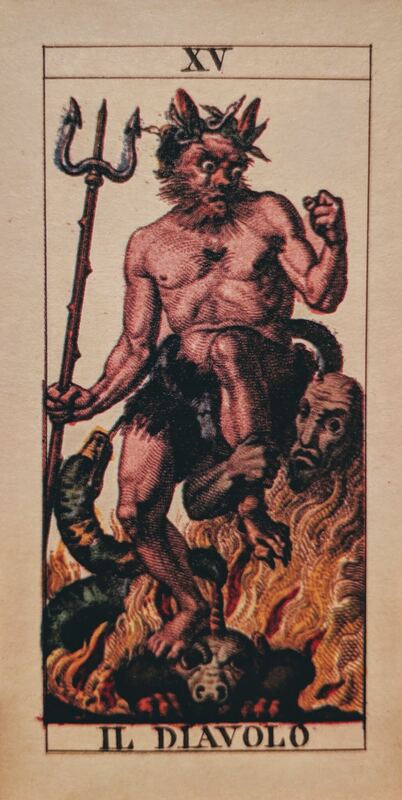 The Devil is extreme individualism. He is the opposite of the Pope, it’s all about listening to your own desires, your own will. 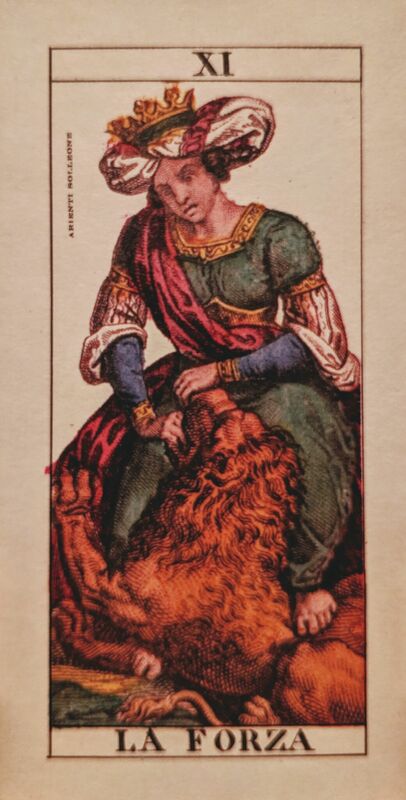 These two cards are reflections of each other, how to be a sheep and how to be a lion. Both cards are about measuring and keeping love and energy. The Lovers is a loving relationship with your partner. And it can have a lot of meanings, from marriage to difficult choices between love and duty. This love/relationship becomes the new driving force in your life. Temperance is patience and growing love inside of you. 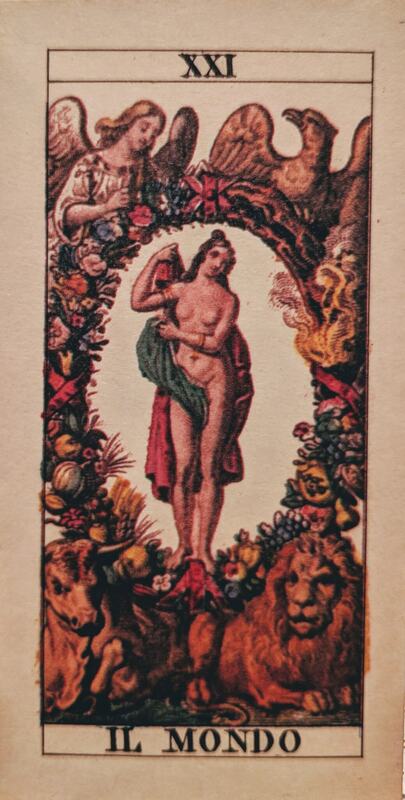 Temperance is the process of transformation through patience and gentle spiritual growth. Of course it’s very similar to what people experience in relationships. When you open up new sides of yourself in your partner you need a lot of patience to grow closer and accept it. This combination of cards teaches us how much love can be about patience, tolerance and slow transformation. Love is a choice that you are making every day. Not only a big decision like marriage, but also committing to it every day. This combination of cards is also very similar to the Emperor and the Tower. But not as dramatic. The Chariot is a card of success and power. You are riding forward to new adventures or returning victorious. But The Death always has the last victory. Death teaches you that all victories are temporary. But also that after everything there will be a new page, a new life. That Death makes everyone equal in the end, no matter how many battles you won. 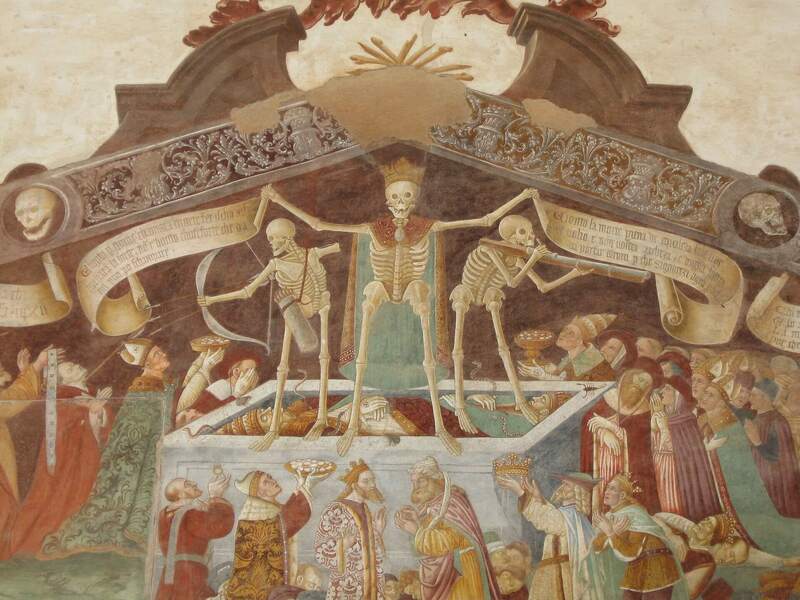 The Triumph of Death, XV century, Oratorio dei Disciplini di Clusone. 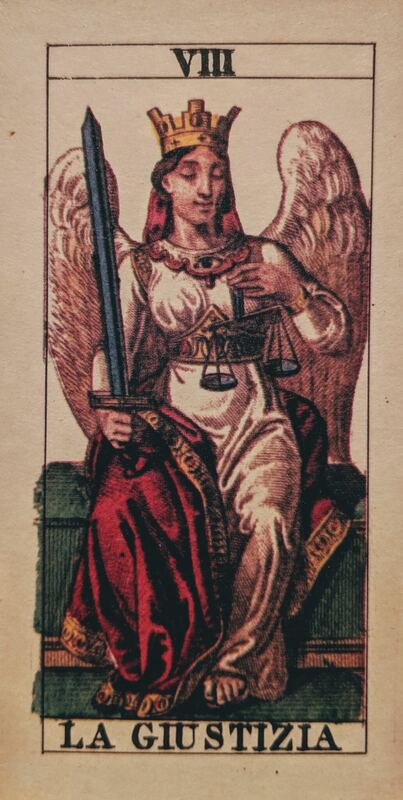 Justice is a card of judging and making decisions. She has her eyes open and on the scales. She judges everything around her to make the right and difficult decision (just look at that sword!). The Hanged man has judged and sacrificed himself. You turn this justice inside out, to judge the world and make right decisions you need to see it from all possible angles. So you sacrifice your own interests to get this knowledge and to see the world upside down. 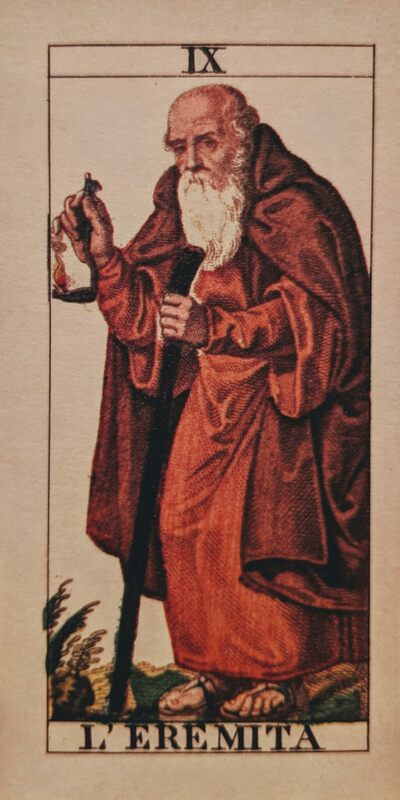 The Hermit meets you from the other side of the deck before the Wheel of Fortune. He is your guide to the other side of the Journey. Strength is the first step on the second half of the Journey. And the first lesson is how to be more stoic and strong like the Hermit is. And to get this strength your spirit must be stronger than your material desires. Your desires from the mundane world.